With new soft growth on roses in spring through summer., aphids can become a problem. They can appear in large numbers almost overnight and they will eat new buds. They are a fairly common pest and probably best known for attacking roses although they can be a problem with hibiscus and other plants as well. They particularly like the new tender growth, and as aphids are prolific breeders they can cover a rose garden in no time. You could try to rely on natural techniques such as small birds, ladybirds and other predators to control these sap sucking pests, however in severe cases you may need to take other action. A parasitic wasp that targets only aphids has been introduced to some rose gardens as a trial, and is proving to be successful. Probably the easiest way to remove these pests is with an organic spray such as a pyrethrum or garlic spray, but consider that these will also get rid of the ‘good insects’ such as ladybirds as well. If you are dealing with one or two small rose bushes you could blast the aphids off with a jet of water, or even wipe them away with a tissue. Try to use sprays including the organic insecticidal soaps, (natra soap is one), citronella neem oil and other non organic sprays as last resort. If you do have ladybirds, then they will often control aphids for you, ifyou are going to use a pyrethrum spray, use it in the evening after the bees have all gone back to their hives. 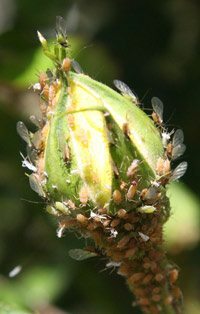 In spring when the weather is warm and humid and the new rose buds are forming, perfect conditions for aphids are created, and this the time for major infestations. So this is the time to watch out for the first sign of infestations and take early action. Companion planting is another form of control, nasturtiums, plants from the onion family (garlic) and even geraniums can help deter these pests. Or try planting dill and fennel nearby as these attract ladybirds.